Sometimes, an actor and a director make a classic sci-fi horror film, and then just decide that the best thing to do after that success is make a comedy-adventure-action-ghost-movie. Thus it was that another classic was born, and for that we are truly grateful! 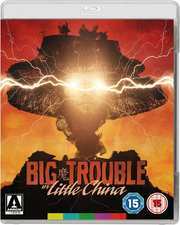 Yes folks, the John Carpenter directed Big Trouble in Little China is finally arriving in HD on Blu-ray courtesy of Arrow Films. This stars Kurt Russell, Kim Cattrall, Dennis Dun, James Hong, Victor Wong and Kate Burton. Arriving as both a standard and steelbook edition, priced at £19.99 and £24.99 respectively, the 1080p brand new digital transfer comes with 5.1 DTS-HD Master Audio and uncompressed stereo soundtracks, an isolated 5.1 DTS-HD music score, English SDH subtitles for the deaf and hard of hearing, and a commentary track with director Carpenter and Russell. Other extras include brand new interviews with Carpenter, Russell, cinematographer Dean Cundey, producer Larry Franco, stuntman Jeff Imada and visual effects producer Richard Edlund. Joining the existing extras of a vintage making-of featurette, extended ending, deleted scenes, music video, stills gallery, trailers and TV spots. Also included is a booklet featuring new writing on the film by John Kenneth Muir, a re-print of an interview with production designer John Lloyd and make-up effects artist Steve Johnson. And the standard release will have a reversible sleeve featuring original and newly commissioned artwork by Jay Shaw, whilst the Limited Edition SteelBook is presented with the original iconic Drew Struzan artwork. 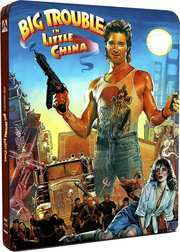 Jack Burton is a reasonable guy who is about to experience some unreasonable things in San Francisco’s Chinatown. As his friend’s fiancée is kidnapped Jack becomes embroiled in a centuries-old battle between good and evil. At the root of it all is Lo Pan, a 2000-year-old magician who rules an empire of evil spirits. Jack goes to the rescue dodging demons, goblins and the unstoppable Three Storms as he battles through Lo Pan’s dark domain.